This game at the Black Gold Stadium started as a battle of 9th versus 10th with both teams starting the night on 33 points. Poole were missing three of their regular back four, yet still boasted the joint best defensive record in the division going into the game whilst ’Marine named another unchanged line-up from the side that defeated Staines Town 3-0 at home on Saturday. Both teams started brightly with Mat Liddiard seeing his left footed shot from Connor Thompson’s corner being cleared off the line in the 10th minute by Jack Dickson which led quickly to a fast break for the Dolphins, but Luke Roberts could only hit the side netting with his powerful effort. It didn’t take long for Roberts to find the inside of the net when the away sides back four were caught flatfooted allowing a long ball from keeper Luke Cairney to bounce in their half and it was Roberts who reacted quickest to control the ball before hitting a low effort into the far corner with Will Henry partially unsighted. Lee Spalding’s men were quick to equalise through some quick thinking from centre half Matt Williams when he hit a superb quick freekick diagonally across field, spotting Ryan Campbell in space on the far side, Campbell did brilliantly to control with his chest, allowing the ball to drop and hitting his effort on the half volley which was too hot to handle for Cairney who got two hands on the ball, but could only watch it loop up over his head and into the goal behind him. One soon became two which quickly became three as Marine’s slick passing game on a favourable surface, against a team who also play good football played right into their hands allowing them to zip the ball around at pace creating chances nearly every time they came forward. Conor McDonagh re-found his scoring touch, picking up a swift passing move to break into the box and steer an effort right across the static Cairney into the far corner ahead of Mat Liddiard capping off another fantastic period of passing football for the blues as he rolled home from McDonagh’s cross to score his first goal for the club. Marvin Brooks dragged an effort wide of goal for a goal kick as the hosts looked to try and get something back before the break. 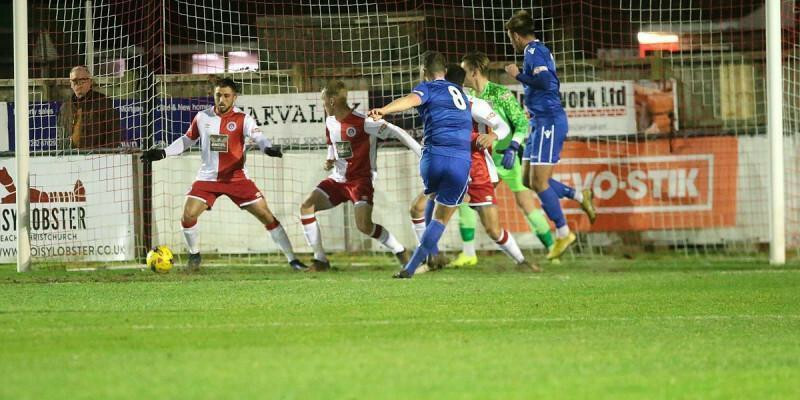 The second half started with a bang when Liddiard got into the box and as both he and a recovering defender went to ground, the defender’s arm landed down on the ball and the referee from Wimborne had no hesitation in pointing to the spot. Stuart Fleetwood calmly stroked home sending Cairney the wrong way to put the away side into a commanding position. Roberts curled an effort from distance at Henry before crossing for Will Spetch who saw his header cleared off the line by Michael Hopkins as Roberts pulled all the strings looking to work his teams way back into the game. But following a quick counter attack, Fleetwood was allowed the freedom of the left hand side to send over an inviting first time left footed cross that McDonagh gobbled up at the far post volleying past Cairney from 6-yards to kill the game off with just under half hour left to play. Poole continued to enjoy a lot of second half possession as Marine sat back on their lead. Jerel Ifil had to clear off the line from Luke Roberts before the winger found the net for a second time as once again he got free in the box to squeeze his shot inside the far post with twenty minutes remaining. Both teams then made substitutions which stopped any momentum either side had going over the final quarter of an hour as the away side secured another crucial three points, taking them up to ninth above their opponents who drop to 11th, but still have three games in hand. The Southern League Greenfields Turf team of the month for December, Swindon Supermarine FC, travel to Harrow Borough this Saturday. Tickets for the coach are £10 which will be departing at 11:45am. Contact the club if you wish to come along.